Three Rivers Press, 9780553418132, 224pp. Sharks Are Flying at Your Head at 300 mph. In the apocalyptic world we live in, Mother Nature is angry. 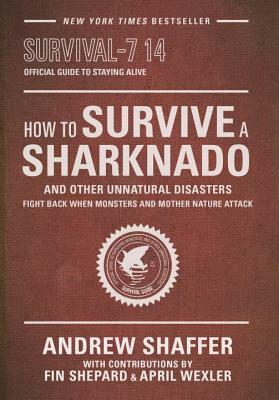 Danger waits at every turn, and catastrophes like the Los Angeles sharknados have taught us that we need to be ready for anything. Too many lives have already been lost. • Useful resources, such as the Shepard Survival Assessment Test (S.S.A.T), and much more. With this essential book in hand, you too can be a hero who laughs in the face of calamity while saving friends and family. Or you can just avoid getting savagely ripped apart by a robocroc. Either way, you’ve been warned. Now be prepared. Sharknado 2: The Second One premieres July 30 at 9/8c on Syfy! Andrew Shaffer is the author of humorous nonfiction and fiction, including Literary Rogues, Great Philosophers Who Failed at Love, and, under the pen name "Fanny Merkin," Fifty Shames of Earl Grey. His writing has been published in such diverse places as Mental Floss, Maxim, and The Daily Beast. He has appeared as a guest on FOX News, CBS, and NPR, and his irreverent greeting cards have been featured on The Colbert Report.